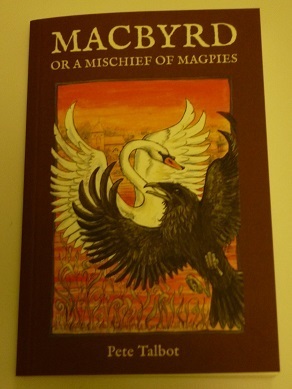 Macbyrd, or a Mischief of Magpies, is a play by Pete Talbot, created for The Rude Mechanical Theatre for their 2016 summer outdoor tour. It’s 1940 in the Sussex village of Jevington. George, a retired mechanic, cheerfully tends his vegetables (for the war effort) when his wife, Lil, comes out with a cup of tea, a piece of delicious upside-down cake, and… a letter from The War Office. ‘What’s this?’ he says. Magpies gather, hopping in a circle on their twiggy legs. ‘What’s this?’ they cackle. ‘Your time has come, Macbyrd,’ they whisper. ‘Listen to the wind!’ Amidst the cabbages, broccoli and comic absurdity, a dark and menacing intrigue simmers as a power struggle breaks out amongst the birds. A timely comedy thriller about how we deal with social change.